* Mariell's Cubic Zirconia Fuchsia teardrop pendant is adj. * 16" - 18" with AAA quality CZ's set in Genuine Rhodium for look of fine platinum jewelry! * This 1 1/4" h top-selling bridal necklace is also a great gift for bridesmaids or mothers of the bride. 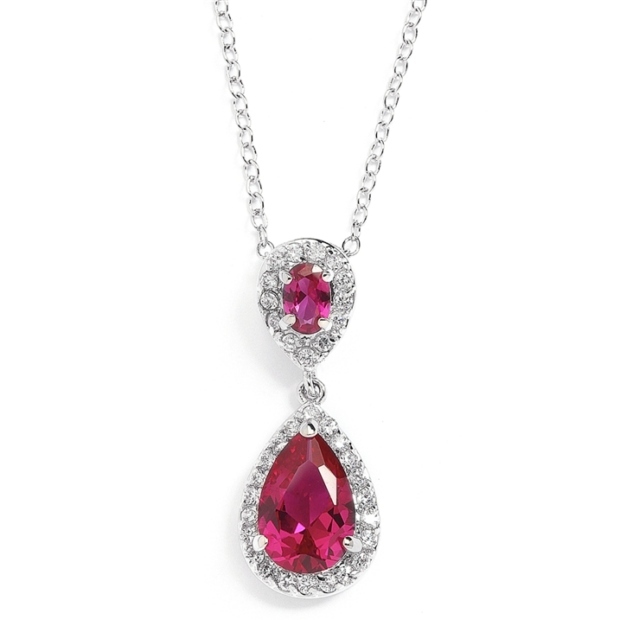 * Mariell's exquisite Fuchsia Cubic Zirconia teardrop pendant is a best-selling classic! * The glistening necklace is plated in Genuine Silver Rhodium and is fit for a royal wedding! * It has AAA quality Cubic Zirconia stones with a shimmering pave frame. * This Ruby Magenta pendant is a gorgeous wholesale bridal accessory and makes a splendid gift for bridesmaids or mothers of the bride. * There are matching earrings sold separately as 4036-FU This Fuchsia gemstone pendant is a must-have for every wedding retailer or stockist's jewelry showcase!